Thanking you in advance for your generosity to make this SPECIAL SKATER'S dream a reality. Melissa works very long and many hours on and off the ice. Due to her Mental Retardation it takes her longer to gain new skills presented to her than the average skater. There are many cost involved in her training. 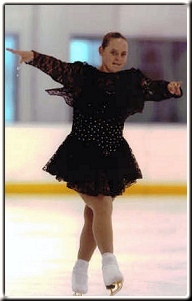 She is desperately in need of sponsorship in order to continue and reach her ultimate dream and that is to skate at the Winter Olympics 2010 in Vancouver. She calls this the "BIG OLYMPICS". She is also focused on International Sports World Games in 2009. Here is a list of Melissa's expenses. travel expenses (gas and lodging) this varies greatly depending on length of competition. costumes...these are custom made and runs about $350 a dress. As you can see there are many cost in keeping this Special Young Lady on the ice. If you would like to help sponsor we'd love to hear from you. ALL donations are welcomed no amount is too small. If you would like to have your donation spent on a particular expense please let us know when you send the form in. It all goes to keeping Melissa's dream ALIVE!!!!!! Please contact us here for sponsorship information, or request our address to mail donations to here.